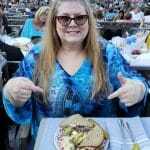 Ruth, a single mom, mortgaged her home and purchased a restaurant called Chris Steak House. 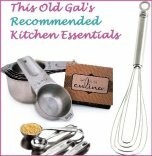 “When a kitchen fire destroyed Chris Steak House in 1976, Ruth was forced to relocate the restaurant to stay in business. Ruth’s Chris Sweet Potato Casserole is very rich and delicious. It is served as a side dish at the Ruth’s Chris Steak House. This Ruth’s Chris Sweet Potato Casserole recipe is the original recipe, which I have converted to the Pressure Cooker. 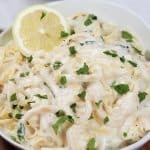 This recipe can be made completely in the Pressure Cooker, Pressure Cooker/Oven or using just he oven. I will show you each method. 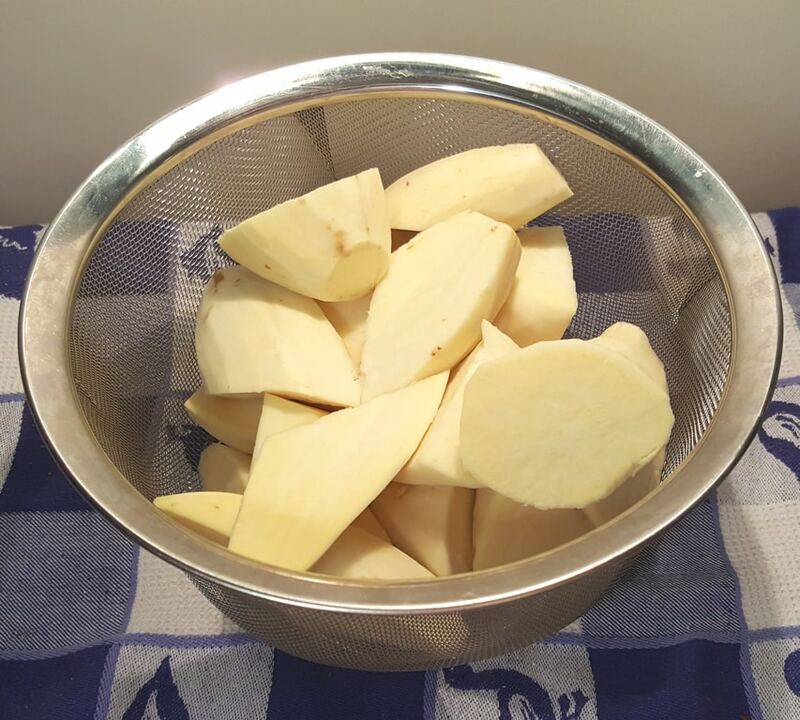 If using a Pressure Cooker, place Sweet Potatoes or Yams into Steamer/Strainer Basket or on a Trivet and cook for 6 minutes. If cooking on the stove, steam or boil, until soft. I prefer to steam my potatoes, sweet potatoes and yams, rather than cook in water. I like the dryer texture that comes from steaming/Pressure Cooking. Add Sweet Potatoes or Yams to a Medium Mixing Bowl and fork mash. Melt the butter and set aside. Add sugar, salt and vanilla to the Sweet Potatoes/Yams. Whisk the eggs and add them into the bowl. Slowly add in the melted butter and beat with a Hand Mixer until fluffy and airy. 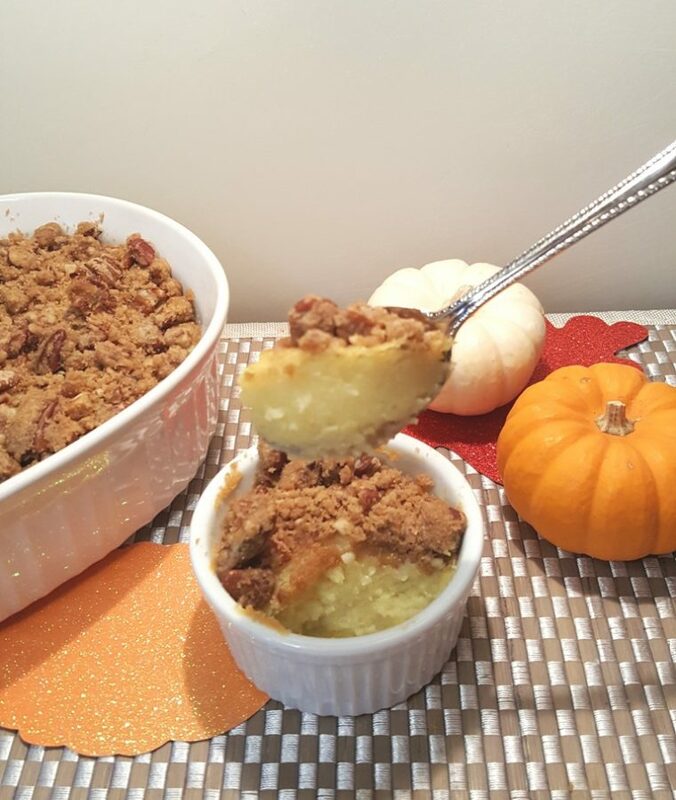 This Ruth’s Chris Sweet Potato Casserole is more like a soufflé, so we want to get a nice rise during the bake. 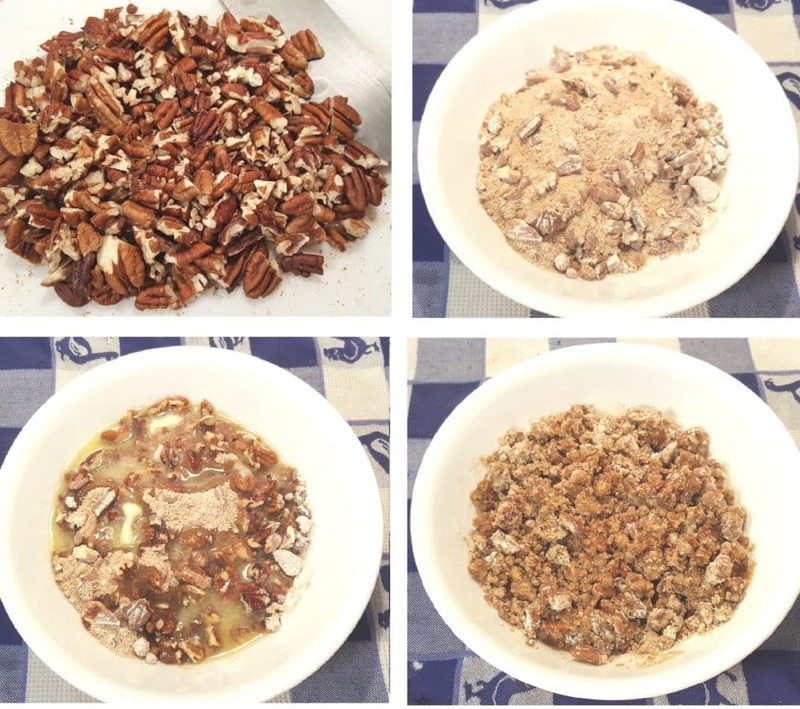 Chop up the pecans and add them to a bowl with brown sugar and flour. Mix it together well. Add melted butter and use a fork to combine until crumbly. Use your fingers to break up big clumps. The Crust mixture should be crumbly and not drenched with butter. Set the Crust mixture aside. At this point, you have several options as to how you would like to cook this Ruth’s Chris Sweet Potato Casserole. 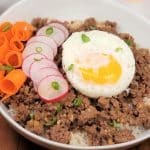 You can completely cook this in the Pressure Cooker, or a combination of Pressure Cooker, Pressure Cooker/Oven . 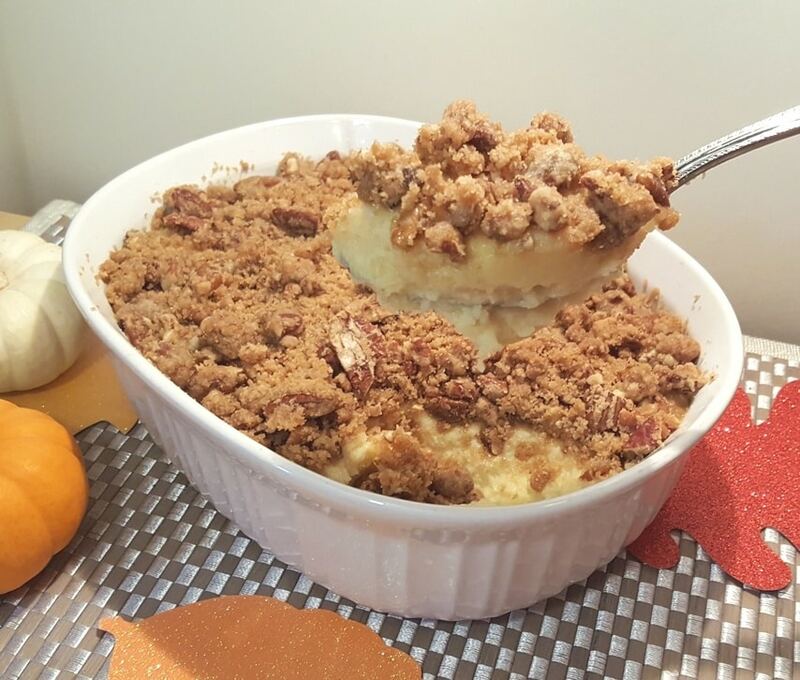 You can also completely cook this Ruth’s Chris Sweet Potato Casserole the oven. 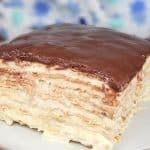 You can also just cook the filling in advance, in the Pressure Cooker or the Oven. The next day, the topping can be added and quickly finished in the oven. 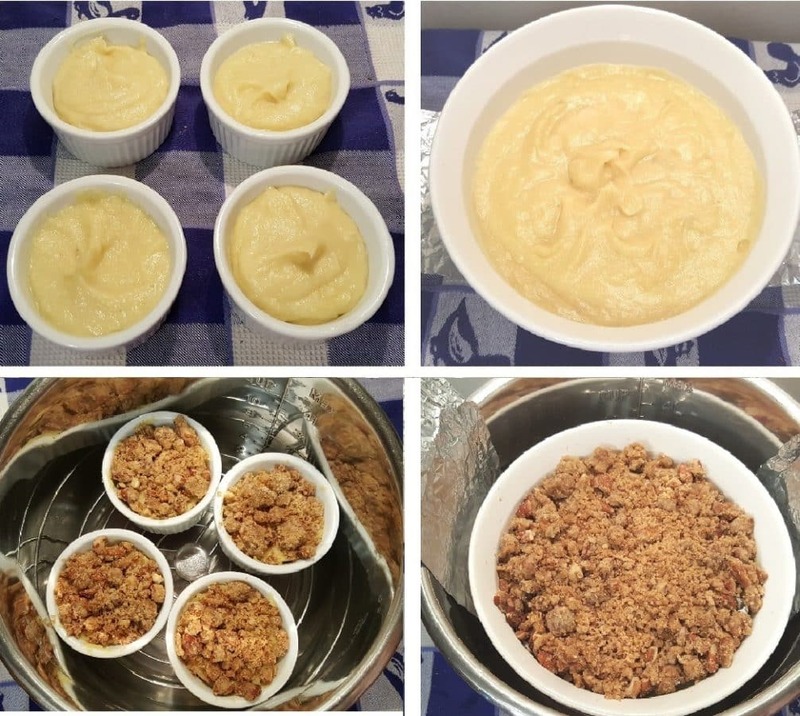 If you would like to cook the Ruth’s Chris Sweet Potato Casserole in the Pressure Cooker and finish off the topping in the oven, just add the filling to individual Single Serving Ramekins or to a Casserole Dish. At this point, you can allow the filling to cool, cover and place in the refrigerator until the next day and then add the Crust and bake 10 minutes. Or, you can add the Crust and pop it in the oven now. If you would like to cook the filling and crust all at once in the Pressure Cooker, sprinkle the Crust mixture over the filling. Cover with a piece of foil. This will come out wonderful too, you just won’t have that extra crunch, the oven gives the Crust. You can always place this under the broiler, if you don’t like the soft Crust. Now for the oven method. Preheat your oven. 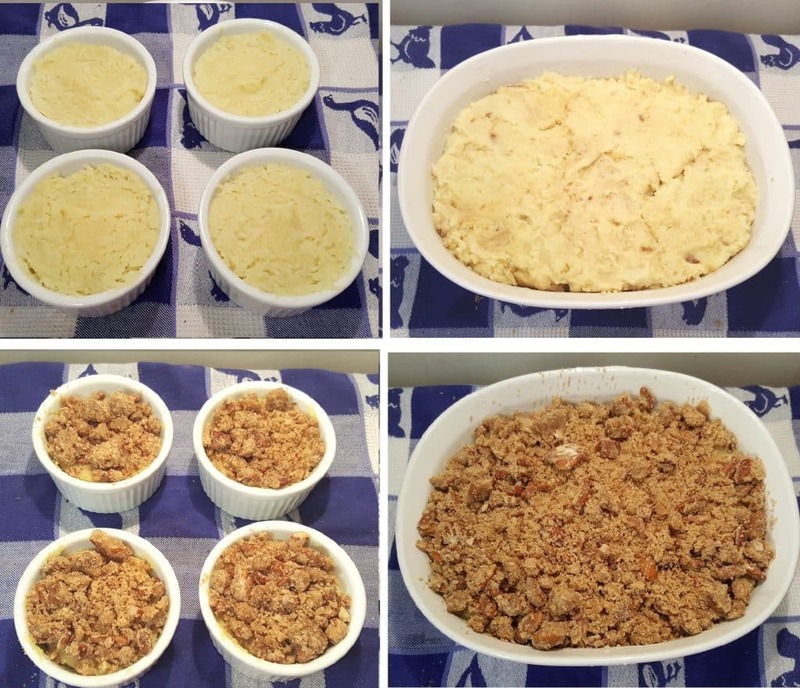 Pour the Filling into a buttered Casserole dish and bake in the oven for 30 minutes. 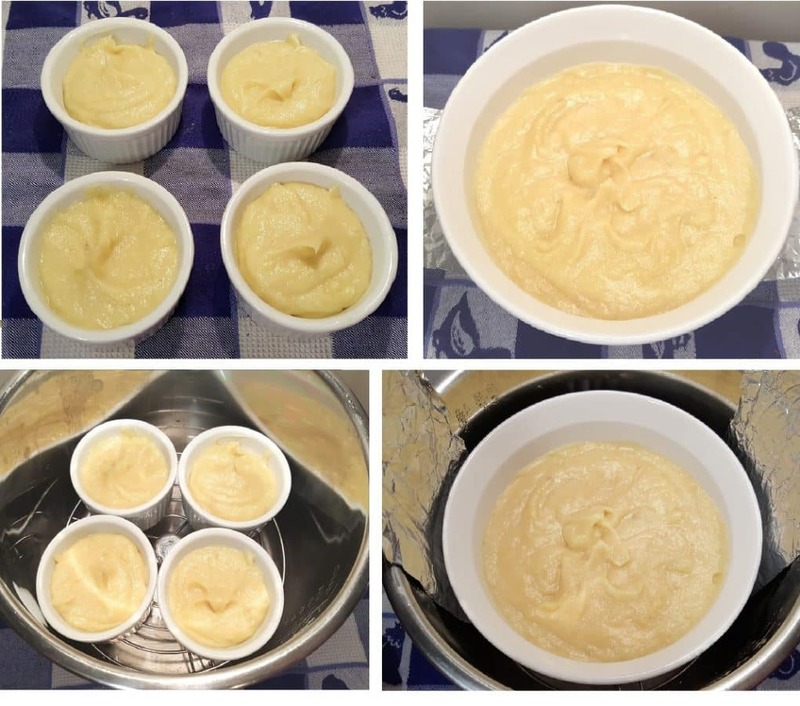 If you want to do individual Single Serving Ramekins, bake those for about 15 minutes. Add the Crust and bake another 10 minutes. This oven method is also recommended for baking the filling the day before. 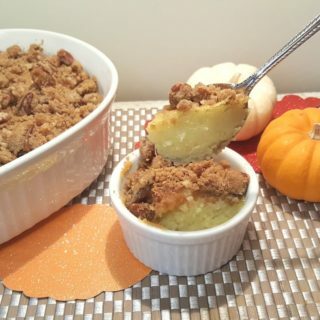 Then just add the Crust, bake and your Ruth’s Chris Sweet Potato Casserole is hot and ready to eat, whether you are hosting Thanksgiving, or you have brought this with you as a guest. I use Sweet Potatoes here, which are very light and a bit less starchy than Yams. Thanks to my dear friend, Pamela Moon Babcock, for giving me this awesome casserole dish, as well as the round one shown up above! 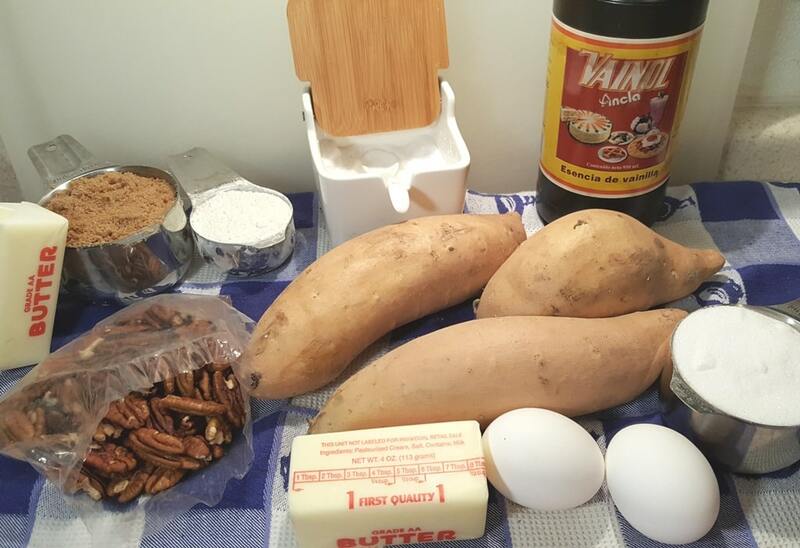 If you prefer your Sweet Potatoes with Marshmallows and yum, check out my Traditional Sweet Potato Casserole, which can be made in the Pressure Cooker or the Oven. 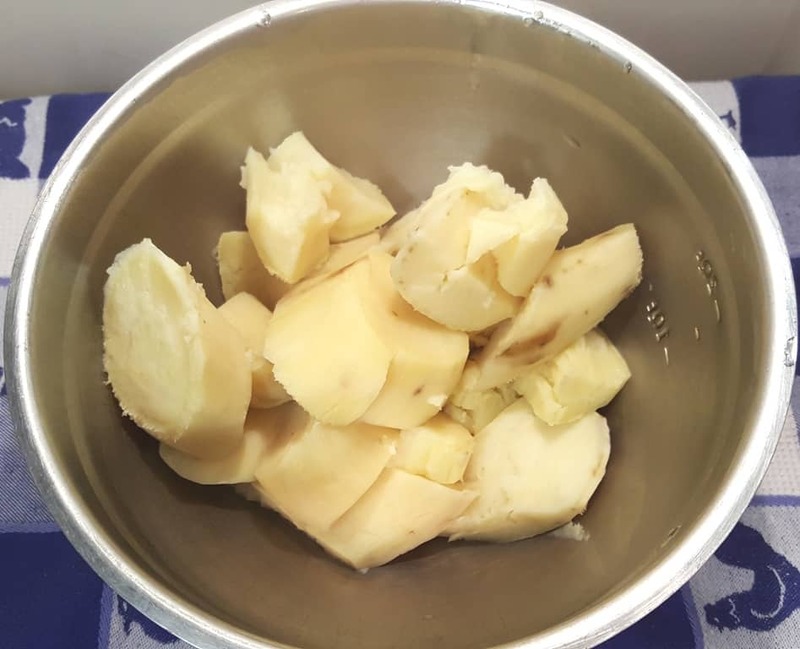 Cook Sweet Potatoes in Pressure Cooker or on Stove Top. Add Sweet Potatoes to medium bowl. Add sugar, salt, vanilla, eggs and melted butter. 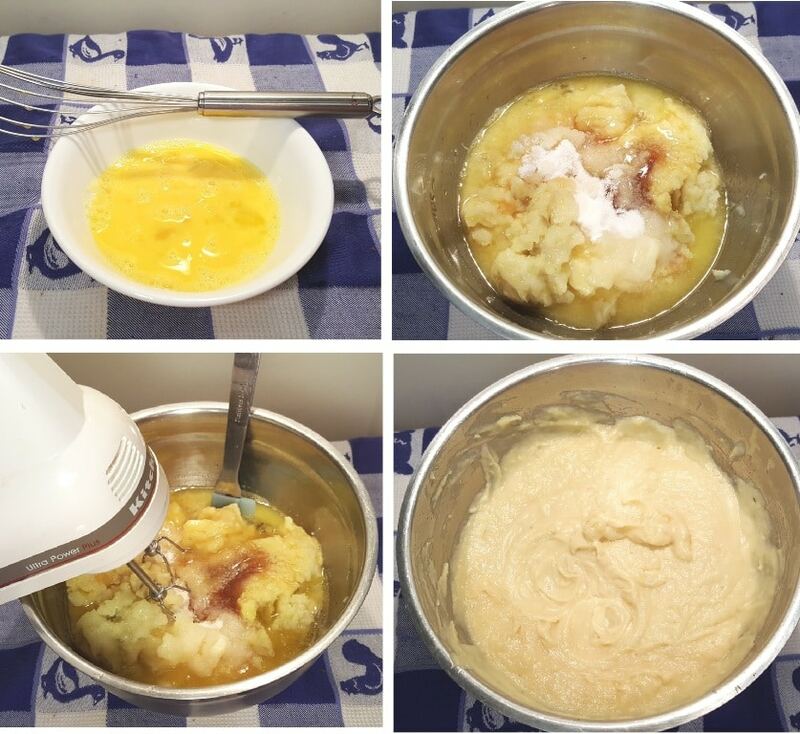 Use an electric hand mixer to whip together filling ingredients. In a small mixing bowl, add brown sugar, flour and chopped pecans. Mix together. Add melted butter and combine with fork. Break up any clumps. Set aside. Grease casserole dish with butter and pour in filling. 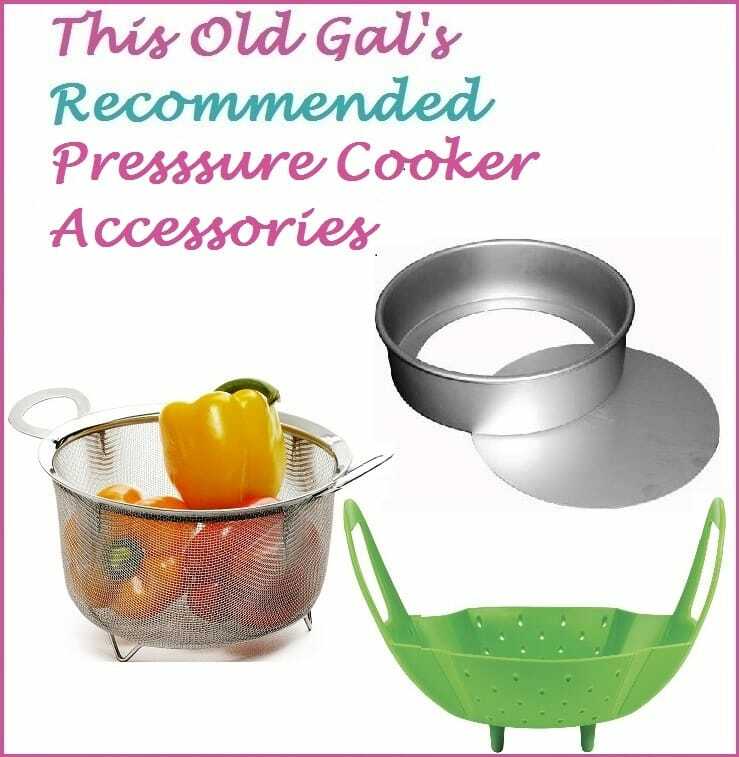 Add one cup of water to Pressure Cooker cooking pot and place trivet. Lock on Lid and close Pressure Valve. 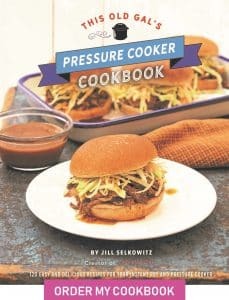 Cook at High Pressure For 8 minutes. Allow a 5 minute Natural Pressure Release. Sprinkle Crust over Filling and bake in preheated 350 degrees oven for 10 minutes. Let rest 10 minutes before serving. Sprinkle Crust over Filling and cover with foil. Cook at High Pressure For 15 minutes. Do a Quick Pressure Release and remove lid. Sprinkle Crust over Filling and bake an additional 10 minutes. The crust should be brown and crunchy. 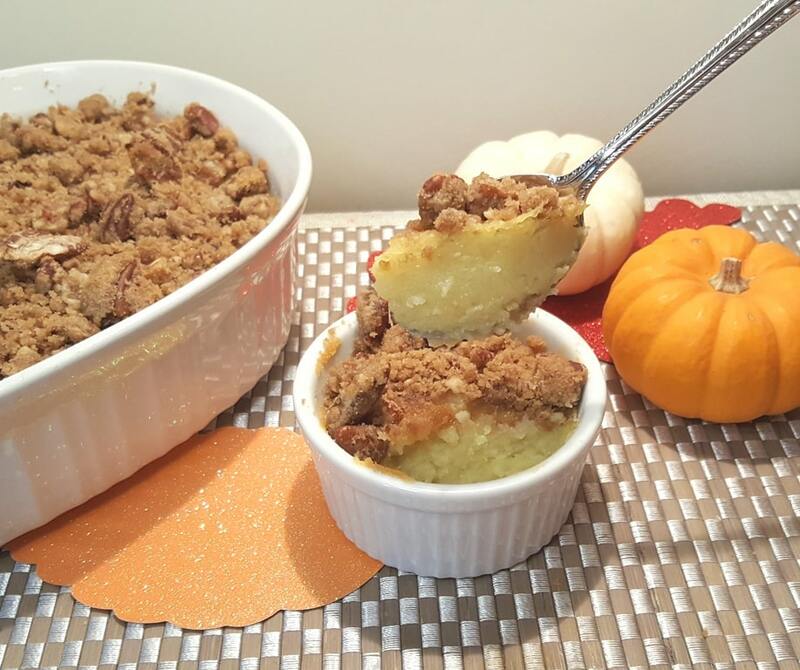 PIN this Ruth’s Chris Sweet Potato Casserole (Pressure Cooker & Oven Method)! 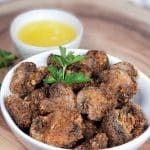 I’m curious about the potato type in this recipe. They aren’t orange at all, is that a special variety? I was wondering the same thing myself so I looked it up and this white potato used in these pictures is just another type of sweet potato. I’ve only ever seen the orange ones. Very interesting…. If I make it the day before, and refrigerate, how long in the oven with topping the next day? 10 minutes doesn’t seem long enough. About how many sweet potatoes should I buy to make 3 cups of mashed sweet potatoes? My daughter is extremely allergic to nuts, but not to those that are actually seeds, like pistachios, sunflower seeds, pumpkin seeds (pepitas), etc. I’m always hesitant to substitute in something like this for fear the “nuts” will become soft. Do you think pistachios would work OK in this recipe?